While there were many “Oh, wow!” moments throughout the Direct (Luigi basically died on-screen), there was one thing that really stood out to me, despite not being on Sakurai’s radar of Ultimate‘s most unhinged Direct reveals. Tucked between the seriously epic Squad Strike battle mode, elimination-style Smashdown mode, and even a mystery mode that is yet to be revealed (dramatically kept blurred during the Direct), there it was. What I had been waiting for: Tourney Mode! 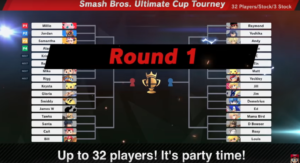 Tourney Mode is back and bigger than ever, allowing up to 32 participants into the tournament bracket. There was one thing my house was known for back in high school (we’re talking circa 2008-2009): Melee and Brawl tourneys. A large group of us would gather around the pile of Game Cube controllers in my living room, holding our breath as we scanned the screen for our nickname and main in the randomly generated tourney bracket. Some would cheer, excited at their upcoming match. Others would cry out in agony as their opponent smiled devilishly. This would usually be my friend, Josh, who spammed Ike’s Up-B over and over and over, and, over, and over, and over. But through it all, there was laughter. Whooping. Clapping. While some of us were actually pretty good, having tourneys was basically just a way for everyone to get together and have a good time. Even people who didn’t know how to play would enter, encouraged by my group of friends to just give it a try. The competitive spirit was contagious, of course, the adrenaline evident when it came down to the last stock. People wanted to win. But we were all there to hang out. There was just something about Tourney Mode that made people come together. Like when all of my friends would jump for joy every time Josh was eliminated. What other instance in all of eternity could friends bond over something like that? 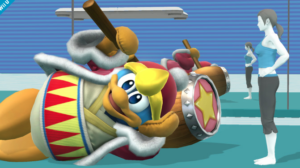 I still remember my friend, who has since moved to New Hampshire, always picking King Dedede, and then just laying down mid-battle, a self-aware meme. I remember my other friend, who has lived in Virginia for the past 9 years, always getting salty when he lost to Josh, and we’d all laugh at Josh’s innate ability to win even when he didn’t deserve it. I remember my best friend and I having dodge battles, where almost none of our attacks would hit, and we’d just keep blocking and dodging and rolling, in an attempt to be the best. I remember the pride I felt winning against all the dudes, my countless hours of practice paying off when I saw my name slide into the victory bracket after the final match. When Super Smash Bros. Wii U came out I was beyond excited until I saw that offline Tourney Mode was missing. And I’ll never get why they got rid of it. With the introduction of online play, it seemed like Tourney Mode would be bigger than ever, with players able to not only compete with friends offline but create tourneys with similarly-skilled players online. But it seemed like Smash 4 had taken all of the competitiveness away from their gameplay modes. 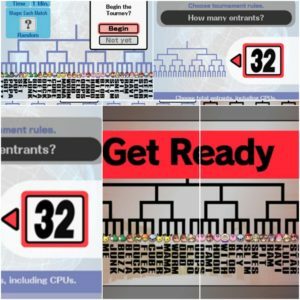 For this article I attempted to do some research, to see if I could find out why Nintendo decided to cut Tourney Mode from Smash 4, and while I can’t find a single straight answer on that, I did find endless forums dedicated to finding out the same thing: Where is Tourney Mode? Each thread was filled with people saying it was their favorite mode. me: why did you like having tourney mode in brawl? jeff: i liked 1v1 battles with no items. and it was good with a bunch of people, since it randomized the match ups for you. me: how do you feel about it not being in smash 4? jeff: is that the wii u one? me: why did you always pick dedede? jeff: i picked dedede for laughs. or when i didn’t think i would win. By now I was in college across the state, but I had a group of friends back home that would play. Still, I found myself playing less and less. To be fair, I don’t know if it was solely because of a lack of Tourney Mode. But it just didn’t feel the same. It didn’t feel like a game that could be taken to a party or get-together. It wasn’t something you could bring to someone’s dorm room and everyone would start cheering and know what was about to go down. I don’t even have any memories of my time playing Smash 4 in college. Not a single one. When the Direct started, there was only one thing on my mind: Captain Toad. But when I saw the announcement of Tourney Mode my entire mood shifted. I became very drawn into Squad Strike mode, and found myself smiling at the idea of the elimination-style battle where you could have multiple people on your team, thinking, Finally. Some offline battling with friends. Then… I saw it… As the participation number kept going up and up on the right side of the screen, I started thinking about all those times back in high school when we’d have 16, 24 people over my house. All crowded around the TV. People raising their controllers in triumph. Some groaning, their heads lolled back, agony washing over them as they were kicked out of the tourney. It’s a bittersweet memory. While it was definitely the highlight of my high school years, it also one of the only things that makes me sad about “growing up.” We’re all apart. We all have jobs. For a while, a few of us from that same group would get together every Sunday to play video games and board games, but soon people would get bored and wander off to find a beer. Some would start watching sports. I’d just put all the board game pieces away and close the box. I know people change, and that life changes. And that’s okay. There are not many games that not only stir up a true sense of competitiveness amongst friends but bring them all closer in the process. I felt Smash was that game. And with Tourney Mode coming back, I feel it could be that game again. The game that gets everyone together. Ultimate will be that game that gets everyone hype, no matter what their life is like outside the game. No matter what other interests they have. When Tourney Mode is on, nothing else matters. I love playing video games and watching esports, and I love writing about them. I’m a professional writer, journalist, editor and social media manager and a very-not-professional Yoshi voice actor. I probably eat sushi about five times a week and I travel about once every other month to play at various Pokemon TCG regionals all around North America. Undefeated at Mario Kart Double Dash.